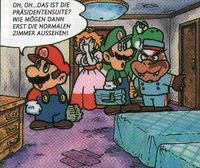 The Gumba Royal Hotel is a hotel on Koopabiza, appearing only in the Club Nintendo comic "Super Mario: Erholung? Nein, danke!" Despite its name, it is in a very bad condition, as its door is immediately breaking when Princess Peach is trying to open it, and there are cockroaches in the bathroom. Even the "president's suite", where Mario and his friends are residing, is dirty and rustic. The water in the hotel's swimming pool is polluted as well. Despite all these facts, all rooms are reserved at the time of the story of the comic. Known employees in the Gumba Royal Hotel are Bowser, who works at the desk, and Morton Koopa Jr., serving as a page. The hotel also has a disco. Obviously, it is popular especially among Mario's enemies, as there are many of them seen in the comic. The name Gumba Royal Hotel is referring to the species Goomba which is officially called "Gumba" in German. This page was last edited on March 25, 2018, at 15:43.